Small Ball Poker - What is it? 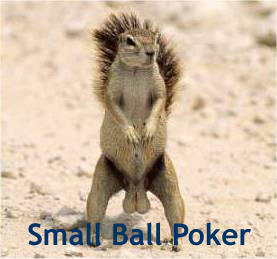 A lot of people are not familiar with the term small ball poker, but it’s getting more and more attention. Small ball poker is a style of play used in Texas Hold’em where you don’t limit yourself to premium starting hands and play a wider range of starting hands without investing too much in the pot to begin with. The idea is that you’re trying to generate monster hands out of average hands at a low cost. The low cost factor is critical because you will not generate monster hands most of the time. Many people give credit to Daniel Negreanu for having invented this style of play, but that’s not exactly accurate. He certainly perfected and promoted it, but many other unnamed players have used this style prior to Daniel’s popularity. They just didn’t bother “branding” their style. So yes, Daniel deserves a lot of credit for making small ball poker known by labeling it, but it is doubtful that he actually created it. Perhaps you’re thinking “I play all kinds of hands pre-flop regularly, what’s so special about this small ball poker thing?” First, its’ not just about playing loosely with the starting hand. It includes other components like table image for example. For this style of play to work well, you must emulate a loose player image. Obviously, you can’t really be a tight player when you’re playing so many starting hands, but the key to the loose image is to make people think you bluff a lot. That means when you do get your monster hand, you can actually raise and get others to call you or re-raise you simply because they don’t believe you. That’s when the style can really pay off. Essentially what happens with this style of play is that you invest in small doses on hands that most poker books would tell you to stay away from. Obviously, you’ll end up folding many of these hands after the flop, but the point is that people will notice you’re playing a lot of starting hands. They will brand you as a loose aggressive player and that will become an advantage later when you hit your hands. Typically what you see with players that use the small ball poker style is that their chip stack slowly but steadily decreases, then BOOM! It increases by a lot, and they end up with a net gain. Then the cycle repeats itself. Think of it as a mutual fund investment on the stock market. The day to day pattern is erratic where the value goes up and down, up and down, up and down. But then when you look at a quarterly report, and a yearly report, you start to see a trend where the average growth is positive. Well… perhaps not in today’s market conditions but you get the idea. That’s how a good investment would evolve, and that’s how a good small ball poker player’s chip stack will also evolve. Let’s look at how Daniel Negreanu actually plays. If you read poker strategy books, you’ll find that there is a general consensus that a standard raise in Texas Hold’em is equivalent to 3 times the big blind. Typically, when you raise pre-flop, these books will suggest that you do a standard raise. But if you watch Daniel play, he’ll take the books and throw them out the window. Daniel tends to raise by 2.5 x the big blind instead. He does this because he feels that it’s a sufficient amount to make the tight players fold, and someone who would have simply called a 3xBB raise will likely just call a 2.5 x BB raise also. It enables him to see the flop for less. And remember the goal: He’s trying to hit the flop so he can then build the pot and get a huge gain by winning the hand. And once in a while, he’ll be in a great position to setup a bluff also. I said that small ball poker involves playing starting hands loosely, but that doesn’t mean you’re playing any hand just for the sake of being lucky. The style still involves a hand selection process. The rule is simple: Pick hands that have the potential to make big hands. That means connectors (suited or not) and suited cards that have the potential of making a flush. If you get dealt a three and a four, play them. If you get dealt 6-10 suited, play them. But play them if it’s cheap do to so. That’s the key to this style. Small ball poker works best when the blinds are small and is much harder to play when the blinds get expensive because suddenly you can’t get “cheap” flops anymore. That means that if you will be using this style, two things will happen: First you are going to create a table image that you can exploit, but at some point in the game (if you’re playing a tournament), you’ll have to change your strategy in a way that still allows you to exploit your table image. This style is better suited for cash games, where the blinds remain fixed. The small ball poker style can only work when used by experienced poker player against experienced poker player. If you’re playing with relatively inexperienced players, they’re not going to pay attention to how you play or study your betting patterns. They’re not going to pay attention to you period and since your table image is an integral part of the small ball poker style, it simply can’t work in this scenario. For this style to work, it is critical that your opponents study you and react accordingly.